Currently, I, Lyth, (aka Booya Dev), am in need of a new workstation computer to develop for new platforms, and to well... game (it's research, I swear!). I currently run Booya Dev out of my free time, and make about $3 an hour at work. As many of you know, I'm in China and I struggle sometimes to make ends meet. I'd be incredibly appreciative of any donations that are sent. #gbdev, #n64dev, and #nesdev communities have helped me out so much in the past, and I'm incredibly thankful. Anybody that donates will receive a photo of my face in amazing 8.5x11 @ 500dpi (in a Photoshop file) or jpg. This here is the best reward in the history of "crowdfunding". 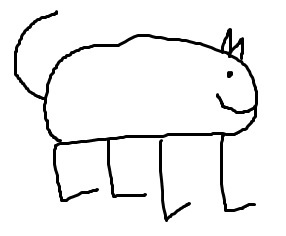 Donators will also receive a 8.5x11 @ 500dpi jpg of this AMAZINGLY BEAUTIFUL drawing of a Cat, done by me. Please note that Nintendo 64, Gameboy, NES, etc are not the same as money. They are much more valuable and I could not accept them. They're too priceless.